Good news for folks living in a sleepy section of Milford , involving an on-going gaffe on Google Maps. Turns out Walnut Beach goers are no longer being sent to their quiet neighborhood when they type in the address on Google Maps. According to screen grabs, travelers are still not getting the right address when they pop in Walnut Beach on Google Maps on their iPhone. 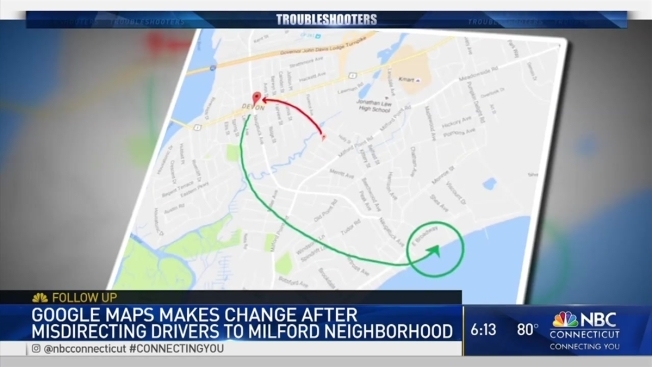 Residents on Fairfield street, reached out to the NBC Connecticut Troubleshooters saying drivers looking for Walnut Beach ended up outside their garage about a mile away. After NBC Connecticut's report aired last Friday night, those same residents said their no-exit neighborhood had traffic reduced by 75 percent. They said there are no more confused cars racing through the intersection w/phones in hand. "We looked into it and are working to fix the issue and ensure that drivers are routed directly to Walnut Beach rather than the residential neighborhood. I'll let you know as soon as the fix is complete, which should be in a couple days or so."